If there's one thing you can say about Louisiana, it's that there's certainly no shortage of water. Situated next to the Gulf of Mexico, Louisiana is famous for its estuaries and bayous, and is also home to hundreds of lakes, streams, and rivers, not the least of which is the mighty Mississippi. Amidst all that water is some of the best fishing in all of the United States. The species below are among the five most popular gamefish anglers target in Louisiana. Read on to find out just where it is you have to go to catch trophy fish in the Bayou state. Bobby Lane holds up a whopper at the 2012 Bassmaster Classic on the Red River. The great thing about Louisiana is that you can find huge largemouth bass in pretty much any body of water. While you could easily make a whole article of choices for best bass lakes, the three below are the cream of the crop for big-time lunkers in Louisiana. The Red River recently played host to the 2012 Bassmaster Classic, where Chris Lane took the competition by over three pounds. 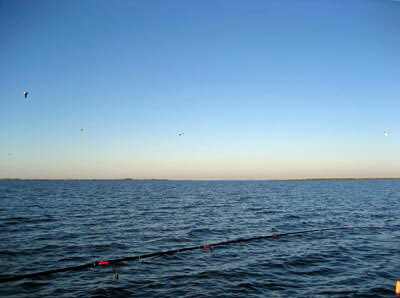 In fact, the Red River has been a frequent site for the world championship of fishing, and it?s easy to see why. The river is made up of five pools, all of them containing loads of bass in the three to eight pound range. Double-digit lunkers are not uncommon, especially around the spawning stage in late winter/early spring. Pools four and five typically hold the most consistently big bass. Bonus: The Red River is a great place for big catfish as well. In the 1990's, there were few better lakes for monster bass in the entire country than the 5,000-acre Caney Lake. 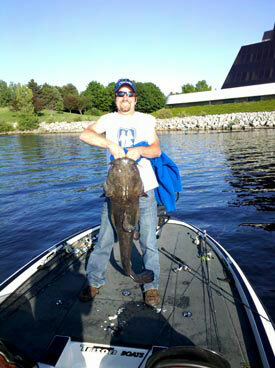 New state records seemed to be caught every few months, with bass over 14 pounds a not too uncommon sight. 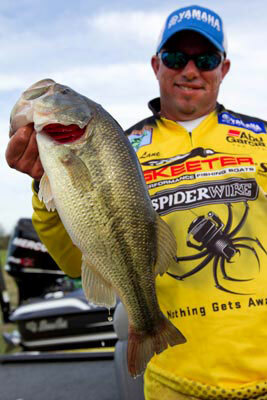 Things have tempered since then, but catching a hog in the 10- to 11-pound range is still very much a possibility. A small lake for sure, but filled to the brim with big bass. The king of all bass lakes in Louisiana is easily the Toldeo Bend. Sharing its borders with Texas, this reservoir is over 180,000 acres and contains some of the highest quantities of 10-pound fish anywhere. Where you fish on the lake depends on what it is you want. The south end typically holds the largest trophy lunkers, but they are scattered and harder to find. As you go north, fish are a lot easier to target, but on average, they don?t reach quite the same weight. Regardless, whatever you bring to the boat, it?s going to be a decent weight. The best time to go is anytime around the spawn, which varies from as early as January to as late as May depending on where you fish in the reservoir. Bonus: The Toledo Bend Reservoir is also the best place in Louisiana to catch monster striped bass. Catfish get so big in Louisiana it's hard enough just picking them up. Catfish are abundant throughout the state of Louisiana, but when get right down to it, there?s really only one place to go for monster whiskerfish: the Mississippi River. No where else in the state can you find the trophy catfish that lurk in these waters. Flathead, channel, and blue catfish are all present. Trophy hunters will especially enjoy the very good chance of catching some huge blue cats: the state record for Louisiana - a 110-pound monster caught back in 2005 - was fished out of this mighty river near St. Francisville, north of Baton Rouge. Anywhere along the river from the Delta up through to the Mississippi state border will yield you the chance for a monster of your own. 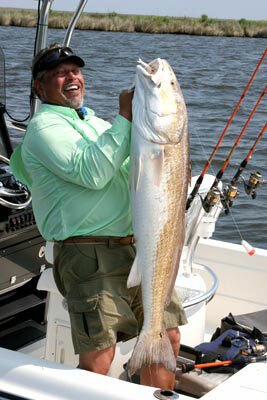 Henry Waszczuk holds up a monster redfish. Even when counting bass, redfish may still very well be the favourite target for anglers in Louisiana. Their abundance, resiliency (populations survived both Hurricane Katrina and the Gulf Coast oil spill), and place in history all contribute the fish?s near-mythical status in the Bayou state. While the whole southern coast is great for reds, the best spot is where the mighty Mississippi flows through New Orleans and into the Gulf Coast. For best results, hit up clear water south of New Orleans in March. Big redfish congregate to the marshes in this area like moths to a flame. For best results, try surface baits or spinnerbaits just below the surface. Take a look at the Top 10 Weirdest Looking Fish Ever Caught! From the sad, drooping face of the blobfish to the teeth-too-big-for-its-mouth payara, you?ll likely never see fish so weird looking ? and they're all caught by people who fish! If you want the chance to catch a state record speckled trout, then head on over to Calcasieu Lake in south-eastern Louisiana, near the Texas border. Plenty of record fish have been caught here over the decades, and despite its popularity for big trout, remains to this day the place to go. This lake, which is really more like an estuary, is 12 miles long and nine miles wide, with an average depth of six feet. The best time to catch trophy-sized specks is late-May and June, when the migration run is at its peak. The southern part of the lake sees the majority of larger fish catches. To catch 'em, throw out a topwater or jig with some soft plastics. Live shrimp is a popular choice for the summer. 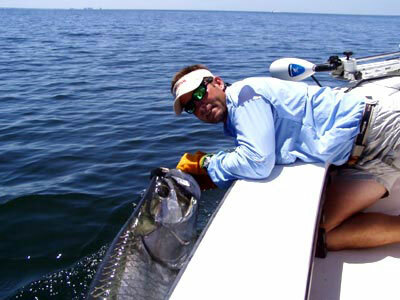 Angler poses with a huge tarpon. They can get even bigger than that in the Delta. Few fish put up as entertaining a fight as tarpon, and that?s just the smaller ones. When you get to catching tarpon in the 200-pound range, it?s more like a battle royale. The entire Delta is a hotbed for tarpon, but there?s something about the shorelines surrounding Venice that these huge fish love. Unlike tarpon fishing in Florida, the most popular way to catch tarpon out of Venice is specially-designed artificial baits. Not just because it saves having to get live bait, but also because there?s less of a chance of having bait stolen by one of many other species of fish that share the same water. Mark some time off for the summer if you want big tarpon as large numbers migrate through the Venice area during the months of July, August, and September.